Next to air, water is the most vital element for human survival. The human body is 75 percent water. You knew that. But if you’re under the age of 50, you may not know that there was a time that you could actually stoop over a creek or stream and dip into cool, fresh, drinkable water. You can’t do that anymore. No matter how high you go in the Rockies, no matter how far you roam in the tundra, you’ll be hard-pressed to find a river, rapids or rill undefiled by human-generated pollution, most of it extremely dangerous to consume. Nowadays, in order to simply survive, society has to push H2O through filters, purifiers and pipes just to remove toxins, poisons and chemicals. Yet we must have water and when the temperature rises and humidity drops, it’s even more essential. Water you waiting for? 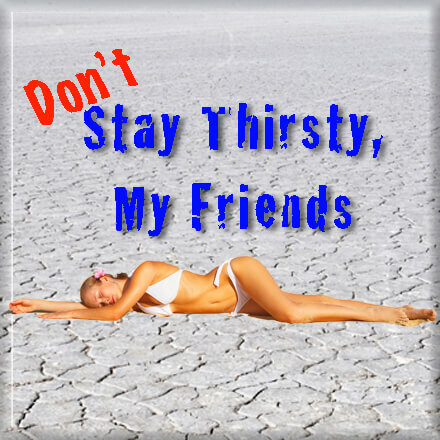 Most of us drink too little water during a day. Replenishing what is lost through perspiration and respiration during a hot summer day is crucial to health. But what is the best liquid to drink? With the glut of sports drinks, vitamin waters, smart waters and just plain bottled water, which should you choose? The short answer is that no one agrees. But for sure, you must drink something. Despite all the water on our planet, only .3 percent is drinkable. We can’t drink from the oceans; the salt content is too high. And we can’t drink water from streams or lakes in this country; they’re too polluted. Over half the rivers or lakes in the U.S. are not even fit to swim or wade in, according to the Environmental Protection Agency. As a result, the water we drink must be treated before it’s safe. Water is the basic rehydration drink. Tap water? Omaha’s not so good. For 6000 years, humans used various means to purify water. Our testing equipment at the time was simple: If the water looked bad, smelled bad or tasted bad, it was bad water. Testing techniques have improved somewhat but we still have pollutants in our drinking water, even after it reaches the tap. Certainly, water utilities generally meet federal standards. However, meeting federal standards and providing pure drinking water are two different things. There are many potentially hazardous chemicals and pollutants that are in typical tap water. For a list, visit the Environmental Working Group’s informative website at www.ewg.org/tapwater/index.php. You’ll find that Omaha ranks #94 out of 100 cities tested. Find the information for Omaha and learn what they say is in your tap water. Still, rehydrating with tap water is better than not. Bottled water: not a good choice. The biggest shock for a time-traveler whisked from the 1960s to today would be that we bottle and sell water. Yet much of the “premium” water we buy in those little plastic bottles is nothing more than tap water. Sometimes it’s filtered. Sometimes not. Estimates are that bottled water costs 1900 times more than tap and for the same liquid. Bottled water will hydrate you the same as tap water but the real difference is the impact on the environment. In a recent year, Americans bought 28 billion plastic bottles of water. Though they are recyclable, 86 percent of those bottles still end up in landfills. 17 million barrels of oil were needed to make the plastic and the carbon footprint is enormous. Plus the plastic bottle leaches bad chemicals you don’t need for rehydration. These are some of the reasons cities and college campuses are banning plastic water bottle sales. Enhanced bottled waters. Some enhanced waters contain vitamins, herbs, minerals, even chocolate. Mostly additives are at a fairly low level compared to what can be replaced by food. Noted health expert Andrew Weil, M.D. calls them “gimmicky and overpriced. Let water be water.” Sounds like good advice. Bottle your own. If you want to hydrate with water, don’t like tap water and are smart enough to avoid plastic bottles, a home purification system is a great choice. There are many types: simple filters, compound carbon filters, reverse osmosis and combined systems. Commercial pitchers and faucet filters are a minimal step. The most powerful home-based units use the reverse osmosis process. With that multi-step system, regular tap water is sent through stages of particle and chemical removal through carbon filters. After most of the dissolved solids are removed, the water is forced through a special membrane that allows only the water molecules and a small amount of other components through. The result is a very pure form of water that is considered better for drinking or cooking. An RO unit can cost less than $20 dollars a month to rent. You can fill your own glass carry-bottle and save a ton of money over the plastic bottle kind. Sports drinks. Gatorade is the famous granddaddy of bottled drinks concocted to rehydrate after and during vigorous exercise. Developed in the mid-1960s to help University of Florida football players rehydrate in the severe conditions of summer, there are now several versions and many competitor drinks doing the same sort of thing. The typical ingredients of a sports drink include carbohydrates and electrolytes. The idea is to replenish what may be lost in vigorous exercise. The electrolytes help move the liquid into the body faster according to Gatorade’s promotional materials. The down side of sports drinks is the unknowns. What exact chemicals are in it? What makes it that weird neon green color, for example? How about the sugar content? The original formula actually had cyclamate, a banned chemical now, in it. Some research indicates a slight hydration advantage in some areas during extreme activity. It’s still highly debatable if a sports drink is the best choice for casual or even moderate exercise rehydration. Interestingly, some research in the UK showed that beer rehydrates after vigorous exercise in a way similar to sports drinks. In the long run though, beer will dehydrate. Make your own sports energy drink: switchel As much as the Florida Gators would love to claim it, they didn’t invent the rehydration drink to replenish electrolytes and carbs. A drink called variously “switchel,” Haymaker’s Punch or ginger water dates as far back as the 1600s in the Western Hemisphere and similar drinks go back even further. Starting with water, add some vinegar, spice it with ginger and sweeten with honey, maple syrup or molasses. Some historians note that lemon was a favorite additive, also. In the heat of harvesting hay, switchel was a popular drink for farmers in the 1930s. It hydrated and nourished them. The components contain natural elements that are similar to those in sport drinks. Whatever your sensible choice, swill it down, sweat it out and stay healthy in the summer sun. That Boy Ain’t RightWhere Are the Hip Hop Fans?